There are too Many People in Iran who Witness Injustice and Do Nothing! 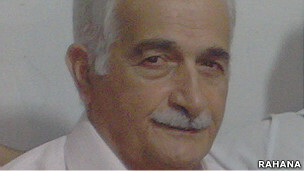 Sari Baha’i citizen Vajiollah Mirzagolpour was arrested after being summoned by the Intelligence Ministry. It is such a shame that any people can commit such a heinous act in the name of any religion and the rest of that community stand by and watch!! How low can a people get? I grew up in his house. I know exactly what was happening in his mind when that was happening to him. He was praying for them, he was asking God to forgive them. Yes this is BAHAI teaching. I am so proud of you, my dear uncle. Yet the balance of mercy expressed by the individual believer must be met by its other wing; the hand of justice by the international community and its institutions of law and human rights. Mercy without justice leaves the tyrants and wolves to tear the meek and peaceful into pieces and get away with it. Holocaust taught humanity, we must speak up and act on “Never Again”. Where is the action of the international community in administering justice? How long we should witness this flagrant expressions of inhumanity? Shifteh Ansari posts on Iranian.com about her feeling of sadness and shame for Iran. We need more like her because as of now there are plenty of people in Iran who just stand by and watch. In the face of injustice and inhumanity, the worse anyone can do is do nothing. A beautiful arrangement of group chant of Remover of Difficulties in Arabic to remember the Baha’is of Iran. This entry was posted in chants, Farsi, human rights, letters, News, videos and tagged Bahaís of Iran, chants by keyvan Geula, human rights in Iran, RAHANA, Sari, vajihollah Mirza Golpoor. Bookmark the permalink.